Show of hands if you thought I was going to give away a Kitty or Monkey today! I’m sorry to disappoint, but no animals are up for grabs today. Instead, I’m bringing you a giveaway from the new Etsy Shop Kitties and Monkeys! No, she doesn’t sell Kitties and Monkeys either. 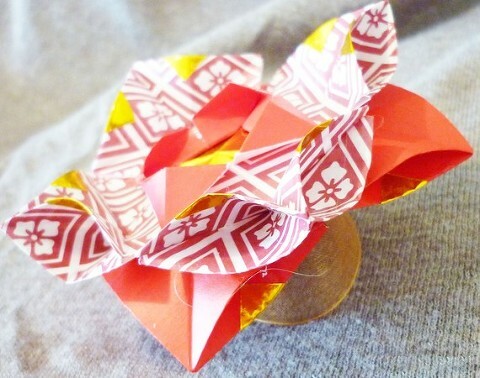 Kitties and Monkeys is just a cute name for a shop that sells amazing origami paper crafts. I actually know the shop owner, Louise. Crazy story here… Way back in the late 90’s, when I was in high school, (yes, those of you older than me probably just rolled your eyes) these two random girls stumbled upon our church youth group meeting. The two of them quickly became friends with all of us and regular members of our youth group. Louise was one of those girls! Now, I hadn’t talked to (or seen) Louise in a very long time, so was surprised and thrilled to get an e-mail out of the blue from her a little over a week ago. She had seen my post encouraging you all to shop the businesses that had offered giveaways this year and wondered if I’d help her promote her new Etsy shop. I’m all too glad to help a friend out! I love the detailing I saw in the items in her shop. This one is 4 point star flower. She’s brushed it with a non-toxic glaze to help it hold up longer and it has a pretty ribbon attached so you can hang it. How cool is this big star?! You know where I think this star would look awesome? At the top of a Christmas tree. 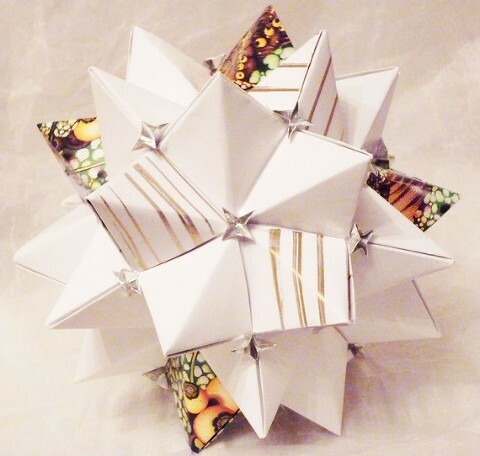 Or how about buying several of these little star clusters and attaching them to Christmas gifts this year? Not only would it be a pretty addition to a package, but the receiver could hang it on their Christmas tree for years to come! Visit the Kitties and Monkeys shop and then come back here and tell us which item stood out to you the most. Remember, leave a separate comment for each task you complete! Giveaway is open to US and Canada residents and will run through Monday, December 6th. Winner will be randomly drawn and announced the morning of the 7th. Winner will have 24 hours to claim their prize or an alternate winner will be selected. Good luck!